1930-1940 Corn Harvesting Equipment Bill Gillen Of Monmouth Illinois in a box wagon that was used to haul the corn to the crib. The wagon will have a bangboard added to it in the fall of the year so that the ears will hit it and fall into the wagon. Picking 100 bushels of corn and scooping it off was considered a normal days work. He has trained several Illinois State Champions and a National champion in the hand corn picking contest since it was revived in 1975. A peg being used to open up the shucks. Pegs were used to open up the shucks. 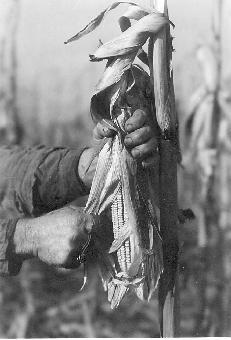 Hooks were developed later that sped the task up for the husker. A man could double his wages if he was good at picking corn by hand. If you got paid 3 cents a bushel in the 1930's you could make $3 a day or $18 dollars a week. 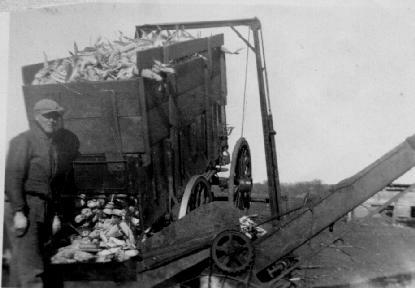 Before the elevator was used to unload the corn a man would scoop it into the crib. After chores in the morning 50 bushels were picked and then scoop into a crib. 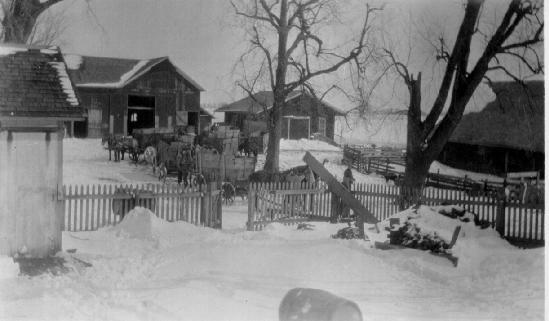 After lunch 50 more bushels were picked and scooped into the crib .Once evening chores were done it was time for the evening meal, then bed. 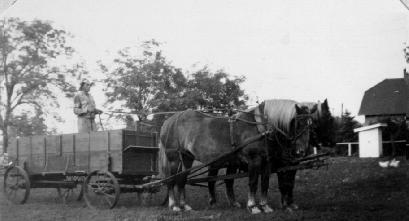 There were five wagons and teams getting ready to harvest corn on the Parish farm near Monmouth , Illinois in the 1940's.